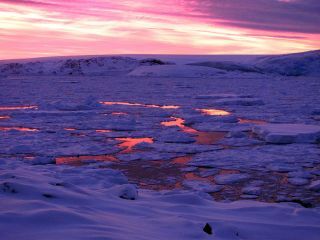 This twilight photo, taken at Palmer Station in Antarctica, hints at what the melting edge of an ice-covered hemisphere might look like around a tidally locked, terrestrial planet orbiting a red dwarf star. Much of such a hypothetical planet's water could get trapped in ice layers on the world's permanent night side. A new study takes a deeper look into the fate of life-permitting water on Earth-like planets around red dwarf stars, the most common stars in the universe. Many of these exoplanets quickly become "tidally locked," with one side always facing their reddish star while the other side freezes in permanent night. On the other hand, this water-trapping phenomenon might boost an exoplanet's odds for life by keeping at bay a super-heating, runaway greenhouse effect that would otherwise eventually dry a planet out and doom extraterrestrial life. As many as three out of four stars in the Milky Way and other galaxies are red dwarfs. These cool stars possess anywhere from about a tenth to half the mass of the sun. The so-called habitable zone, the band around a star where water can exist in a liquid state on a planet's surface, is located very close to dim red dwarfs compared to our brighter, hotter sun — within the relative orbit of Mercury. Overall, the world, when viewed from the star's perspective, might look like a giant eyeball, and so these putative planets have been dubbed "eyeball Earths." Menou's paper aims to sketch in some details on how water would end up distributed on such worlds with perpetual daysides and night sides — in other words, where perhaps half the planet has the climatic ability to evaporate water (turn it into a gas) and the other to freeze water (turn it into a solid). To find out, Menou used software called PlanetSimulator, developed at the University of Hamburg, to model the climates of tidally locked habitable worlds around red dwarfs. Crucially for Menou's explorations, PlanetSimulator can model a hydrological cycle, which is the movement of water throughout a planet's surface and atmosphere via the familiar processes of precipitation (rain and snow), evaporation, condensation (cloud formation) and so on. An "eyeball Earth," with its permanent sun-facing side a dry landscape, a temperate ring near the day-night line where water can exist in liquid form, and its dark side piled high with ice. But for worlds with less than a quarter of Earth's water budget, the models show this small volume of water will preferentially precipitate and freeze away on the planet's dark half. Instead of an eyeball, with either a big oceanic "pupil" or circular, watery "iris" on its dayside, the world might be more two-faced, with arid sunlit and glacial benighted halves. The prevailing moisture transport in the atmosphere on a tidally locked world would lead to massive glacial build-up on the planet's cold side. However, the thickness of this hemispheric ice cap would be limited by the inevitable melting that would occur at its base from the tremendous pressure of piling up so much heavy ice. An aerial view of the front of Aialik Glacier flowing from the Harding Icefield on the Kenai Peninsula in Alaska. Menou's paper explores three nightside ice layer scenarios. For melting at its base, the ice layer might end up floating on a sub-glacial ocean that connects to a dayside ocean. If less surface water were on hand or the nightside temperatures were colder, part of the layer could be "grounded," or in direct contact with the rocky crust of the planet, with ice and water flows occurring onto the dayside at the sheet's edges. Some scientists speculate that Venus, which is basically like Earth but in a closer orbit, actually started out watery like the blue planet. As the young sun warmed up, it triggered a runaway greenhouse effect on Venus, stripping it of its water and sending Earth's twin down a path to hellish barrenness. "Eventually you may boil off the oceans and the planet becomes non-habitable," said Menou. "With water-trapping, when you cannot put so much water into the atmosphere, then it's harder to essentially warm up your planet from the greenhouse effect, which is better for habitability." An artist's conception of an exoplanet with two moons orbiting in the habitable zone of a red dwarf star. "The issue is can you distinguish observationally between a world with abundant water that would not suffer from this risk of trapping, versus one deficient of water that might be subject to trapping?" asked Menou. "At this point I think it's unclear, but I think it's important that we start thinking about these things now. These planets may be the most promising for which we might be able to say something observationally about their habitability in the near future."